There are 4 petrol stations in Phimai town and there is a 24 hour self service petrol pump. 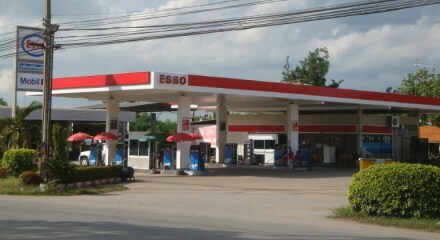 Above is the TJ petrol station (TJ Petrol Park) on the bypass near the Phimai Inn and opposite the electricity company local office. There is a Baang Chaak petrol station on the road into the town, near the rice cooperative/rice mill and about 500m from Phimai hospital. 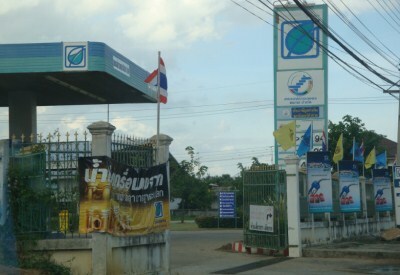 There is a PTT petrol station not far from the Phimai National Museum, on the other side of the road bridge. 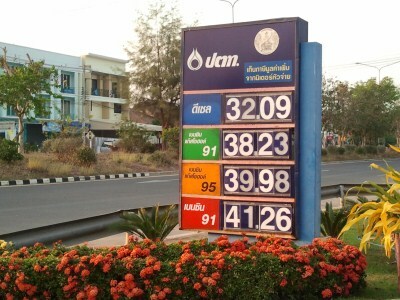 In the PTT sign above, you can see the prices and the colour code for each different type of fuel sold. Red is 91 octane benzine (regular petrol). Orange is 95 octane gasohol (bio-fuel). Green is 91 octane gasohol (bio-fuel). Blue is diesel. Yellow is used for 95 octane benzine (regular fuel) but it is rare to find it nowadays. Petrol prices change quite frequently. 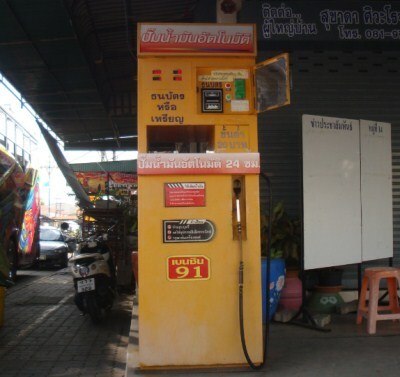 The 24 hour self service petrol pump is located at the junction of Ratchanonilela Road and Sa-Gaew Road, at the house/shop business of the local community leader (poo yai baan). See picture above. As you can see, it sells 91 octane benzine (regular petrol). 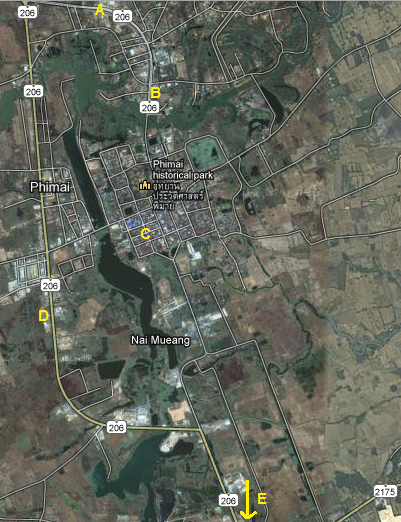 Below is a map showing the locations of where you can buy petrol in Phimai town. You might also find somebody selling petrol by the bottle. There is such a place in Phimai town opposite the entrance to wat bung (wat burapa). The PTT petrol station in town is now closed. A sign says it is for renovation but it has been closed for a few months now and I can see no work being done. 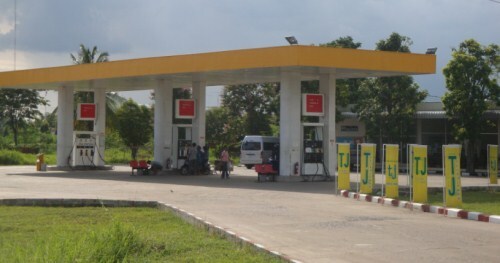 However, its closure coincided with the opening of a new PTT petrol station just outside the town, on the road leading to Korat. The new PTT petrol station has a 7/11 shop and a small food area. 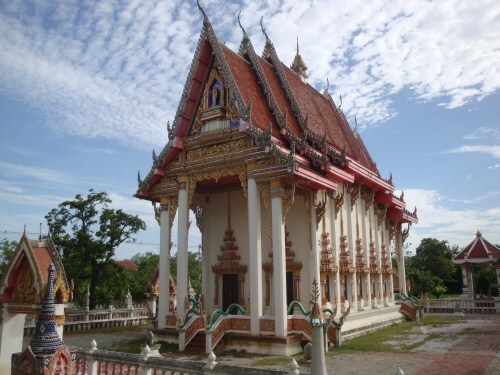 A blog about anywhere in Thailand wouldn’t be complete without a mention of temples. In the town of Phimai there are five Buddhist temples.